The initial nose of Pinner is light on the hop elements and presents additional malt notes before one takes their first sip. Pinner, a dry-hopped India Pale Ale (IPA) pours light from the can but ends up a dark-yellow to orange coloration in a glass. There is considerable effervescence to the beer and a smallish amount of head; the hop aroma increases as it is allowed to open. There is a bold but not overly intense bitterness that immediately presents itself during the initial quaff, which dissipates in short order allowing for a sweeter side to be showcased. The lower ABV (4.9%) compared to a number of other IPAs makes this into a beer that one can knock back without having to worry about the balance of the night. As such, one could easily put away three or four cans of Pinner and have a great night. Pinner holds up nicely as it continues to warm, keeping the balance between hop and malt nicely. The light touch of sweetness is always present but it does not feel as if it is overwhelming in the overall palette of the beer. There are so many intensely-hopped beers on the market that the market has lost sight of the original iterations of the India Pale Ale style; Pinner is a beer that bridges the gap between traditional pale ales and the imperial/double IPAs that litter supermarkets and beer stores alike. The slightly green / dank flavors that come forth after the first half of a Pinner keep things interesting from beginning to end, ensuring that imbibers will want to crack another of Oskar Blues’ latest after they have completed their first (or third, fifth, seventh). Pinner is a beer that one can continually come back to without suffering flavor fatigue. Pinner is Oskar Blues’ latest year-round effort; this throw-back IPA is the perfect beer for spring nights. 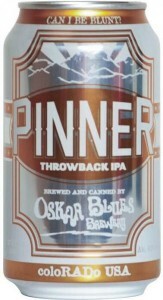 The Oskar Blues website contains information about Pinner and the rest of the company’s offerings.